Looking for rooftop bars in St Petersburg? If so, check out these hottest nightspots below. You should know that St Petersburg's party scene isn't just limited to the street-level but extends up to the roofs of trendy Western hotels or restaurants. Of course, the city’s skyline cannot bear comparison to New York, London, or Tokyo, but you can still get a spectacular view of the architectural beauty of Russia’s Northern Capital from a different angle, while at the same time sip your favorite cocktail or taste delicious food. Below a list of well known rooftop bars in St Petersburg Russia worth visiting for an awesome evening out with friends or even on your own. 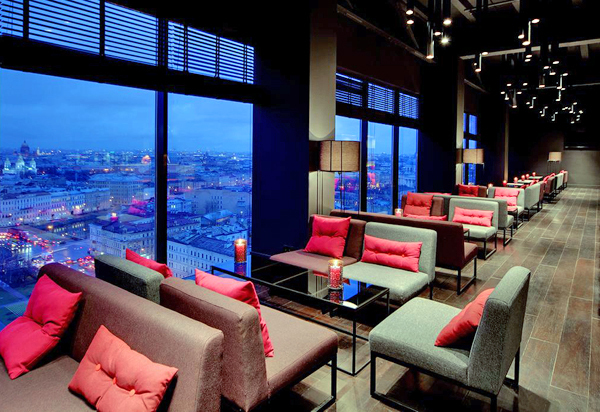 If you want a superb northern view of St Petersburg, head up to the 18th floor of the Azimut Hotel where you’ll find the Sky Bar which is one of our favorite St Petersburg happy hour bars. It’s open from 5pm to 2am. The bar menu covers Scandinavian, Asian and Russian cuisine, and is the perfect place for a romantic dinner and drinks. The White Russian cocktail is highly recommended, while the winner is of course the view – come to look at the gorgeous sunsets over the rooftops. "A High and Handsome Spot"
Gastronomika, open 11am to 1am – Sat/Sun midday to 1am, is a new, and trendy rooftop bar and restaurant that offers a mix of Asian, European, and local cuisine of a high standard. The central area of the restaurant has a huge pizza oven and you can see your food being prepared. The menu is extensive, and the quality is excellent. Enjoy your experience either inside, or on the roof terrace where you can admire splendid views of the city. Reservations are advised. Hi Hat is open from May until winter sets in. This is an interesting and popular rooftop bar to visit for an evening of good music with nicely dressed fellow patrons. This St Petersburg nightclub offers a dance floor, two bars, a restaurant and chillout zone with amazing atmosphere. The roof is a creative space with a grassy lawn and a wonderful view of the Botanical Gardens and TV tower. There are also indoor areas with colourful sofa-bags and swings, and a gazebo too. Many outdoor concerts, theme parties, and film events use this venue. Blok boasts that it offers a record number of steaks and meat dishes, and caters for vegetarians too as it also serves a selection of cold dishes without meat – scallops, shrimps, oysters, and a range of salads. The bar is situated on the roof of the Leningrad Center in the Tavrichesky Garden. The interior is stylishly designed with panoramic windows, a glass roof, fireplaces and although the ambience is glitz and glamour, the atmosphere is friendly and down-to-earth. The bar is open daily from midday to 1am.